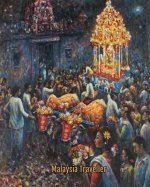 Last week I took myself on a walking tour from Kampung Baru to Chow Kit. 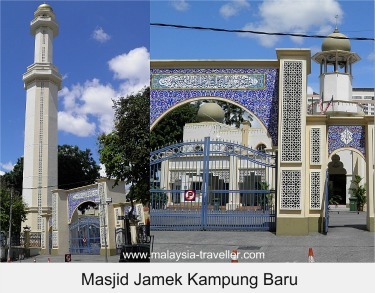 Kampung Baru (meaning 'new village') is a traditional Malay residential area which was established about 110 years ago on a 92 hectare site. 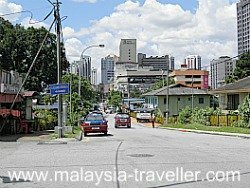 It has a population of 35,000 and although it is located in the heart of Kuala Lumpur it has managed to retain a village feel to it. I began my trip at Kg. Baru LRT station. 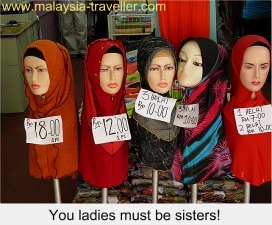 It is only one stop away from KLCC (i.e. walking distance) but it is not practical to walk there from KLCC as the area is effectively cut off by an expressway and the Klang River (see map at bottom of this page). 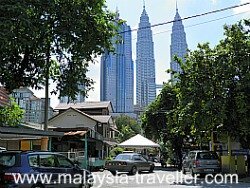 As soon as I stepped out of the LRT station I found myself in a quiet street with low rise buildings, albeit overlooked by the nearby Petronas Twin Towers and other office and residential high rise blocks. Turning into a side street I found chickens scratching around in the gardens of traditional Malay style kampung houses. The area is a mixture of old wooden houses, some newer concrete ones (but still only one or two stories), food stalls, simple shops and so on. One restaurant, Chop N Steak, had been constructed to look like an old ship (or maybe actually was once an old ship). Nice decor but a pity it was not open that Saturday afternoon. Perhaps it is an evenings only place. I bought some fried bananas and steamed sweet corn to keep myself going. 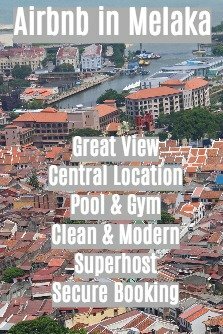 Being so close to the commercial heart of KL, the residents of Kampung Baru find themselves sitting on a potential goldmine as this is prime development land. Discussions are underway to decide on the best way to redevelop this area without destroying its unique character and at the same time securing fair treatment for the landowners. It is a political hot potato which partly explains why the area has survived untouched for so long. Personally I think it would be a shame if these old wooden houses were bulldozed and replaced by yet more tower blocks. 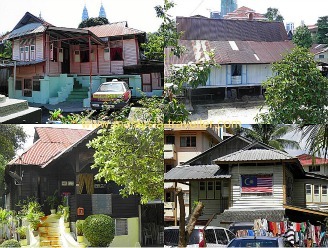 As an alternative perhaps the owners should consider gentrifying the area by restoring and preserving the old houses and renting them out to rich foreign and local business people who might be willing to pay high rents for the chance to live in a traditional Malay village in the heart of KL. (Since writing this a master plan for the redevelopment of the area has been approved). Near the mosque (Masjid Jamek Kampung Baru) I found shops selling prayer mats, Middle Eastern camel sticks and Islamic books and DVDs. From here you can take a detour to Kelab Sultan Sulaiman, a long established club opened for Malays in 1909 where you can find a modern replica of a colonial-era clubhouse. Not far from here the Kampung peters out and transforms into Chow Kit, a bustling market area. The indoor market, Pasar Jalan Raja Bot is shaped like an aircraft hanger and contains a wet market for fish, meat and vegetables as well as dried goods, spices and grocery items. It is dimly lit, the air is fetid and puddles of dirty water cover the floor of the wet market following attempts by the vendors to clean up after the day's sales. I noticed a large rat scampering around. The place reminded me of a Yemeni souq. In an alley way outside, a chicken was screeching pathetically as a poultry seller roughly bent back its wings in order to show off its scrawny chest to a shopper. The shopper was not interested and the chicken was shoved back in its cage to live another day, or another hour more likely. 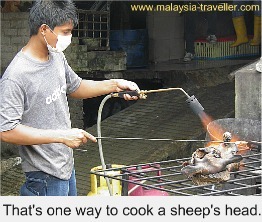 Meanwhile, a guy was burning the skin off a bunch of sheep heads with a blow torch. Apparently this method makes it easier to remove the hairy skin from the flesh. The job of goathead griller is not a career I would recommend to my children. Vegetarians might wish to avoid this part of the market and move on to the fruit sellers in the alleys nearby. Durian was in season during my visit and the sellers had set up stalls so that customers could eat them on the spot rather than having to carry the stinky fruit home on the bus. Aside from food you can buy just about anything at Chow Kit including kampung adidas (the cheap Malaysian-made rubber shoes which are useful for walking in rivers), wholesale paper plates and plastic cups, clothing, medicine, perfume, hardware goods, tudung (the headdress worn by Malay ladies) and much more. If you have seen enough, Chow Kit Monorail station is nearby to take you to your next destination.